Since I’ve been home I’ve kept an eye out for any local coverage of East Africa. American newspapers spend little time covering anything happening outside the United States and it’s rare that I find anything that relates to my recent trip. Unfortunately, this morning I found a tiny news item about the D.R.C. buried in the front section of The Chicago Tribune. Fighting in The Congo has escalated in the Eastern part of the country, where I visited in mid-June. As many as 10,000 refugees are fleeing back and forth across the borders and into the Kisoro area of Uganda. The ranger stations in Virunga National Park have also been attacked and all of the rangers (whose job it is to protect the gorillas) have been forced out of their posts. I haven’t written about my gorilla trekking experience here yet but this hits close to home. Because all of the permits for Uganda were sold out and Rwanda had already raised its price to $500 I decided to take a chance and trek the gorillas in The Democratic Republic of Congo (D.R.C. ), formally Zaire. It wasn’t high season yet and I might have had a chance at a permit in Rwanda but when I met a group of travelers returning from D.R.C. proclaiming it safe I decided to head West. Another traveler, Grace (who you may remember from my posts from Rwanda), was also looking for a permit so we left together. The bus from Kampala, the Ugandan capital, to Kisoro took all day—from sunrise to sunset. 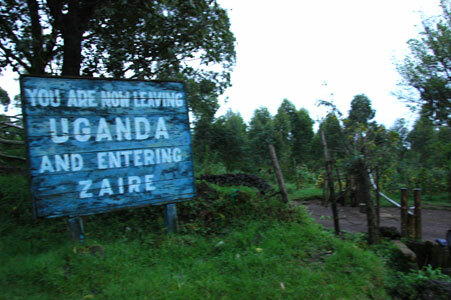 Kisoro is about fifteen miles East of the Congo border, near where The Congolese, Rwandan and Ugandan borders meet. It’s North of Goma, which is a larger border town accessed from Rwanda. We had a good experience, just the two of us with two national military guards in our car (armed with rifles) and seven rangers on our walk through the forest (armed with machetes and machine guns). It wasn’t until we got back into Uganda that we learned that two gorillas had recently been poached, a ranger had been killed and a tourist had been robbed and sent back to the border completely naked. Everyone in a position of authority had declared The Congo completely safe. So it’s not surprising to see these reports, but I hope no tourists have been caught in the crossfire, armed with mis-information from greedy tour operators. It seems that these incredibly endangered animals aren’t getting any safer, despite being on Unesco’s World Heritage List. It’s sad to think that These beautiful animals that posed for me back in June could now be slaughtered to make ashtrays. In a related development, some 10,000 Congolese crossed into Uganda?s Kisoro district yesterday evening, saying they were fleeing fighting between the DRC military and renegade troops. By this morning, the majority had already begun returning home. Due to general insecurity in North Kivu, especially at night, such rapid population movements are relatively frequent. The difficulties of protecting endangered species in such a region are clear, and five national parks in the Democratic Republic of Congo are listed by Unesco as World Heritage Sites “in danger”. In Virunga, nine mountain gorillas have been killed since the beginning of the year. In January two lone males were shot in an attack which was widely attributed to General Nkunda’s troops. A female was then killed in June, and three females and a male slaughtered in late July. It is thought these attacks were carried out by charcoal traders, who are illegally felling the park’s trees for fuel. The Congolese government has brought in various measures to try to protect wildlife, yet the job of policing the parks has become increasingly dangerous, with more than 120 rangers killed by poachers and rebels in the past 10 years. KAMPALA ? The United Nations refugee agency said Tuesday that at least 10 000 Congolese refugees crossed into Uganda Monday following renewed fighting between the Congolese army and renegade troops in the north-east of the vast country. I went white water rafting at the source of the Nile in Jinja, Uganda. I thought I was going to die. Have I mentioned my unnatural fear of water before? More to come when I find a keyboard with letters printed on the keys. Off to Tanzania on the bus tomorrow. ? Note: This entry posted for Megan by Han. A lot has happened since my last post. My seven days in Nairobi were all about getting money, eating food and booking a flight home. I spent the entire time scouring websites and travel agencies to find a cheap flight home. From Africa, I was considering anything under $1,000 cheap. Trouble is it’s high season in Africa and Europe. When I asked travel agents for a price most looked at me like I was crazy and said “you know it’s high season, right?” Many told me to check the web instead and a few suggested I not go at all. In the end I was torn between flying to London on Kenya Airways or Qater. I figured that it might be worth paying an extra $100 to stop in Qatar for a day or two. But, on the last day, when I was making my final decision the Qatar agent told me I’d have to arrange a hotel through them. I walked out. I paid, in cash, for my $500-ish one-way flight from Nairobi to London on Kenya Aiways on Monday afternoon. That’s a student fare, folks. I was quoted the fare at $490 but when paying in shillings she figured the price at $1 to 69 shillings when the banks are all charging 66 shillings. That adds up. I’ll stay in London for a few days (I haven’t been back in about seven years) and then fly on American direct to Chicago. My flight lands around 3pm which should land me back home before rush hour on the I90 is in full swing. My transit visa was ending so on Tuesday I took a direct bus from Nairobi to Kampala, Uganda. I paid extra for the luxory bus with wide seats because many people told me the regular bus often breaks down and takes 20 hours. This bus had three less seats than the seating chart listed which meant I had no seat. I made a fuss and they finally gave me a single seat, which is what I had booked. We were even served breakfast—two pieces of fried bread, a small sausage and passion fruit juice. The ride was completely uneventful and I surprised myslef by not reading my novel or listening to my novel for the entire 15 hours. I have become a master at passing time. The nun sitting across from me was overly concerned about where I was going and when we got off the bus at 10pm she took me aside to arrange a taxi. I just stood back and let things happen and in the end a Korean missionary from my bus took pity on me and gave me a ride with his Kenyan missionary friend. It took us an hour to find the place and I felt bad for inconviencing them. My first full day in Uganda I rode a boda-boda (motorcycle taxi) into town with another American girl who’s traveling alone. We were both hunting for spare gorilla permits but didn’t come up with anything. 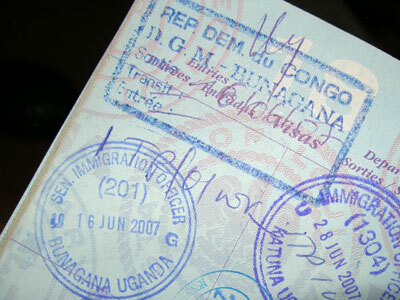 At the moment permits for Uganda are $375, ut they raise to $500 July 1st. Rwanda has already raised it’s fees to $500. We had a nice lunch at a Western mall and then saw Oceans 13, which just came out here this week. We walked around lookgin for internet and shopping a bit before landing at an Irish pub for the night. She had met a drummer a few nights before and we sat and listened to a Uganda band play mostly American music in an Irish pub. It was probably the least “Ugandan” day I could possibly have. There are a lot of activitie here including white water rafting on the Nile, gorilla and chimptracking and a few chill-out lakeside spots. I have some plans in the works and will let you all in on what’s going on as soon as I’m back in internet range. One of the more significant things that has happened to me recently is my iBook screen dying. It’s been a slow death but the Apple dealer in Nairobi proclaimed it “too expensive to fix.” I left it in a locker in Nairoi. What that means for you is that there will be no map, budget, sketchbook, souvenir or gallery updates until I get home in August. I’m as sad about it as you, believe me. My iBook has been my best friend on this trip and I already miss it.